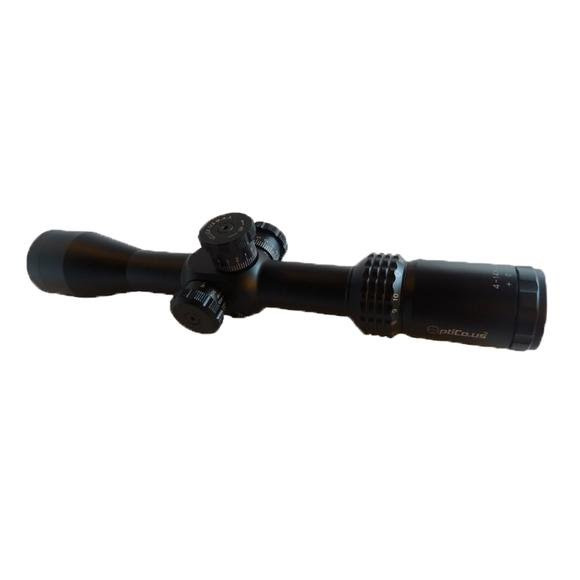 The 4-14x 44mm FFP is a high end long distance hunting scope. It's dedicated to the challenges of big game hunting at longer distances. Adjustable parallax ensures the reticle is properly positioned on the target. If you regularly require more than 15 MOA elevation at distances you need to be sure of, this is the scope for you. The 4-14x 44mm FFP includes a 4.25 inch Sunshade + pop-up lens covers. The 4-14x 44mm FFP is a high end long distance hunting scope. It&apos;s dedicated to the challenges of big game hunting at longer distances. Adjustable parallax ensures the reticle is properly positioned on the target. If you regularly require more than 15 MOA elevation at distances you need to be sure of, this is the scope for you. The 4-14x 44mm FFP includes a 4.25 inch Sunshade + pop-up lens covers. Beautiful clear optics with 44mm objective lens that balances compact design with good target acquisition. FOV at 100yds: @ 4x = 27.2 yards; @ 14x = 7.85 yards. Mil-Dot FFP reticle for precise ranging and accurate hold-offs when there isn&apos;t time for Elevation MOA adjustment. Elevation Turret: 1/4 MOA Audible Click. 15 MOA/rev. Total adjustment at least 100 MOA. Windage Turret: 1/4 MOA Audible Click. 15 MOA/rev. Marked +/-7 MOA. Total adjustment at least 100 MOA. OptiCo.us FFP Ballistic Calculator calculates MOA from your firearm ballistics plus Mil-Dot measurement of target size at any zoom level. 30mm Tube for extra strength, rigidness and MOA adjustment. Pop-up lens covers + 4.25 inch Sunshade included.